Every generation has its folk heroes. Inspirational rebels, they often become vessels for people's frustrations with authority. Robin Hood, Bonnie and Clyde and Jesse James are just a few of our outlaw folk heroes. We remember them as charming and magnanimous tricksters, legendary for their brazen feats of lawlessness in the face of a corrupt or inept system. People aren't ignorant of the reality - most realize that these legends were often little more than sociopaths operating well outside the standards of civil life. We simply choose to ignore their more destructive qualities in favor of romantic notions about freedom and individuality. Griefers are internet folk heroes in this sense. They fulfill the promise of the online gaming space - these unpredictable epic stories created by the users instead of developers - and act as central players in the legends that are helping to define online gaming. Also like real-world folk heroes, more than a few griefers are self-involved nihilists whose goals and actions are fundamentally at odds with the structures that make online games playable in the first place. 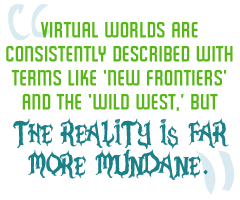 The internet and virtual worlds are consistently described with terms like "new frontiers" and the "wild west," and their users as pioneers. The reality, particularly in regards to MMOGs and virtual worlds, is far more mundane. The most popular games are heavily designed affairs that carefully bring players together while providing them with constantly changing content. This makes for a polished, compelling and reliable play experience. Every session of World of Warcraft is likely to feel productive in some manner. Didn't beat the entire dungeon? At least you walk away with a bit of new gear, or a couple bars of experience at the very least. Holiday events are so well planned that Martha Stewart could learn a thing or two from them. And I would be remiss not to mention more traditional competitive multiplayer games like Team Fortress 2 or Call of Duty 4, whose multiplayer experiences have become carefully tailored to pit like skill levels against each other and string players along with a seemingly limitless array of achievements and unlockable items. However, astute players know there is a master delicately tugging on the strings of it all. When Blizzard created a zombie outbreak around Halloween of 2008, it felt more like an acknowledgement than a surprise, a thoughtful lagniappe from the development team to its loyal fan base. The chaos and excitement that accompany a truly unpredictable occurrence simply wasn't there; instead, there was a tacit acknowledgment that players were merely getting their $15 a month worth of attention. The cold, hard truth of online gaming is that the majority of players want to be coddled by the developers in their daily gaming experience. In the gossip and word-of-mouth atmosphere that is a part of present-day gaming culture, the reality of carefully controlled online spaces is nothing short of censorship. It's not that game developers are intentionally acting as thought police, but rather that apocryphal tales and legends have no room to grow organically. Griefers are, by their own admission, the LSD-spiked fruit punch at the company Christmas party. At their best, griefers are able to replicate the lofty goals of artists in the 1950s that developed the idea of the "happening" - an event that transcends the tedium of everyday existence and forces some examination of life from those who witness it. Griefers are often painted as the Mad Hatters of online gaming. But if that's all they were, their public presence might be contained to a few humorous fan videos on YouTube.